Roller coasters make you feel like you're living life on the edge! But in reality, they're controlled—every ride is the same. But what if it was different? What if rides would go faster when you got scared? That's what a team at Nottingham University is trying to do. 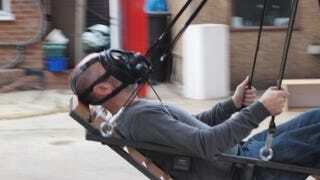 They're trying to create rides that are controlled by the 'bio-feedback' people give them. For example, a 'buckling bronco' ride is controlled through a medical sensor attached to the rider. If he can control his breathing, he can ride the bronco in a controlled motion forever. If his breathing gets faster (aka he's getting scared), then the bronco will move wilder and eventually throw him off. Another ride they built was a swing, and the same idea applied, if they panicked, the swing would shudder. If they kept calm, they could keep on swinging.